Our story begins in the year 867. That year the Danes captured York and, according to the Anglo Saxon Chronicles, “there was immeasurable slaughter among the Northumbrians.” (Yorkshire was then part of the Kingdom of Northumbria). The Archbishop of York, Wulfhere, fled the city. Syneon, an 11th century monk of Durham Abbey tells how Wulfhere found refuge at “Hatyngham in Hwerverdale, upon the bank of the River Hwerf between Otley and the Castle of Sciptun”. There must have been a well established Christian community already here although the Church was of people and not a building. Worship in those days took place around a carved stone cross. The remains of Addingham’s cross was discovered in 1947. Also discovered was a carved bone comb case dating from this time. During excavations, prior to building the extension to the Church Hall, many Anglo-Saxon burials were uncovered. Wulfhere remained in Addingham until about 875 when he was recalled to York by Guthred, the then Christian Danish ruler of the city. He remained in York until his death in the year 900. Image bottom left: This gravestone is in the undercroft of York Minster. 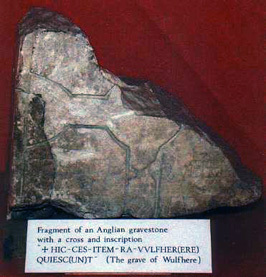 It is not known if it is the gravestone of Archbishop Wulfhere.